In the Seven Kingdoms, some children are born just a little bit different. Some can swim or juggle better than anybody else and some are blessed with fighting or in the case of Katsa killing. These special abilities are called Graces and although these people are a benefit to many the Graced are shunned and even feared by most people. Graces are practically impossible to hide, as they cause the eyes of the Graced to turn two different colors. As soon as a child’s eyes change, they are given to the king of their land to serve him as he sees fit. Katsa discovers what her Grace is when she is 8-year-old and easily kills a man. She is immediately put to work as her uncle King Randa’s enforcer sent to torture and kill those who defy the king. While Katsa doesn’t openly defy the king, she secretly creates the Council carrying out missions to bring justice and safety to the people of the Seven Kingdoms. On one such Katsa meets Po, a prince from one of the other Seven Kingdoms Graced fighter, and the first person to be able to match her in a fight. Soon Katsa and Po, discover a secret that puts the fate of the Seven Kingdoms in their hands and the fight that ensues will make it impossible for Katsa to use her Grace. 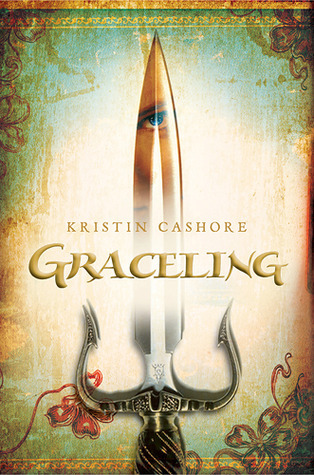 Graceling by Kristin Cashore is kind of a polarizing book. It seems to be one of those books you either love or you hate and I honestly? I loved it. The main character, Katsa, is incredibly flawed and because of this you get to see her learn and grow throughout the whole book. I love the setting of the book, the whole premise fascinated me. The idea of Graces and finding out that some Graces are not what they seem was intriguing and page turning. There is nothing slow about this book. It starts right in with a mission for the Council and keeps going all the way to the end. The characters are fun and engaging. I love the dynamic between Po and Katsa and I love that they are both strong separately and together. I also kind of just love Po. There is a lot of criticism for the adult themes in this book and to a point I agree. I wouldn’t let my young teen read this. Since Kasta is Graced with killing, it can be a very violent book and there is also some sexual content. I wouldn’t recommend it to people who offend easily because of a couple of scenes, but the book is not saturated with graphic material. I think the biggest criticism people have for this book is they don’t like a decision that Katsa makes at the end of the book. Honestly? The decision wasn’t my favorite either, it wasn’t the decision that I would have made, but I didn’t hate the character for it, as some did. It stayed in sync with what we knew about her from the beginning and while I was a bit stumped by her decision, it didn’t ruin the story for me. In conclusion, I love this book. I loved the flaws and the failures, as well as the triumphs of the characters. It is a book I will read again.